Magnetic: Cage Closed is a fun physics-based first person shooter, but it’s no Portal 3. Since there hasn’t even been an announcement on that one though, why not read on for our review? Within a few minutes of playing Magnetic: Cage Closed, its inspiration is blatantly obvious. The game looks and feels a lot like Portal, albeit with a few twists. The familiar: attracting and repelling cubes/boxes using a powerful magnetic gun, overcoming puzzles while using said gun and a lot of square-looking corridors. The not-so-familiar: in the plot of Magnetic: Cage Closed, you find yourself trapped inside a giant prison and cast inside some form of psychological experiment as you try to escape. The story then unfolds through a series of (often formulaic, but fun) block puzzles, combined with the odd moral choice here and there. Think of the movie Saw, but not that suspenseful. A comparison to the movie The Cube is probably closer to home, but perhaps not as familiar. Between those two (familiar and non-familiar) forces, the game unfolds more of less like you’d expect if you’re a fan of the genre – which is a good thing and a bad thing. 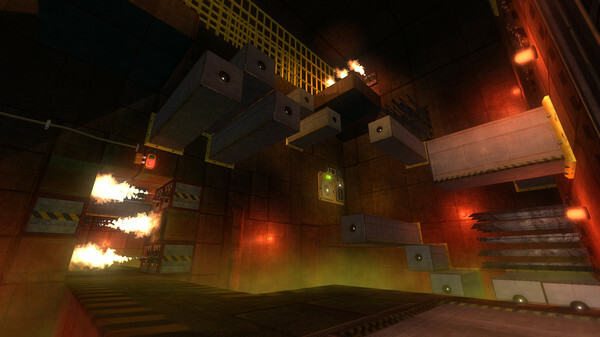 If you love all things Portal and jump at every user-made mod for it, then you have to try out Magnetic: Cage Closed. It’s an extremely competently made game with a storyline that’s different, and it’s different enough from Portal to stand out from its famous cousin. After the initial few levels, the art style changes to something that gives Magnetic: Cage Closed a bit more identity of its own as well – with a darker setting to match the prison setting that you’re in.